In the fasting state (sometimes known as the post-absorptive state, as it begins about 4—5 hours after a meal, when the products of digestion have been absorbed) metabolic fuels enter the circulation from the reserves of glycogen, triacylglycerol and protein laid down in the fed state (Figure 5.7). Stimulation of the breakdown of glycogen to glucose 1-phosphate in the liver, resulting in the release of glucose into the circulation. As discussed in section 5.5.3.1, muscle glycogen cannot be used directly as a source of free glucose. 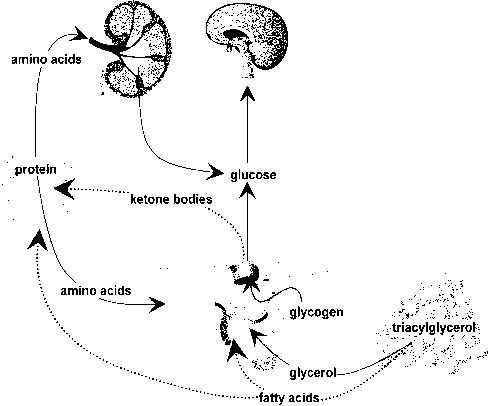 Stimulation of the synthesis of glucose from amino acids in liver and kidney (the process of gluconeogenesis; section 5.7). relief of the inhibition of hormone-sensitive lipase in adipose tissue, leading to release of non-esterified fatty acids. Figure 5.7 An overview of metabolism in the fasting state. other fuels do so, in order to spare glucose for the brain and red blood cells. Any metabolites that can be used for gluconeogenesis will be used to supplement the relatively small amount of glucose that is available from glycogen reserves — the total liver and muscle glycogen reserves would only meet requirements for 12—18 hours. 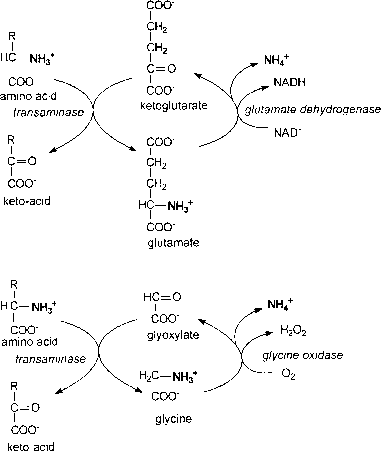 The main substrates for gluconeogenesis are amino acids (sections 5.7 and 9.3.2) and the glycerol of triacylglycerol. 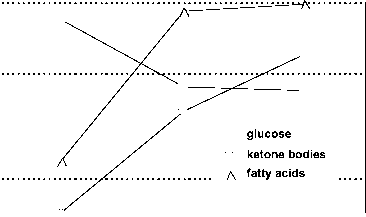 As discussed in section 5.7, fatty acids can never be substrates for gluconeogenesis. Tissues other than red blood cells can utilize fatty acids as metabolic fuel, but only to a limited extent, and not enough to meet their energy requirements completely. By contrast, the liver has a greater capacity for the oxidation of fatty acids than is required to meet its own energy requirements. Therefore, in the fasting state, the liver synthesizes ketone bodies (acetoacetate and P-hydroxybutyrate; section 5.5.3), which it exports to other tissues for use as a metabolic fuel. Figure 5.8 Plasma concentrations of metabolic fuels in the fed and fasting states and in starvation. 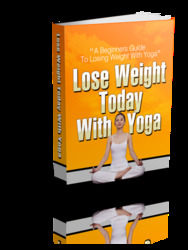 concentration of ketone bodies increases continually through fasting into starvation. After about 2—3 weeks of starvation, the plasma concentration of ketone bodies is high enough for them to be a significant fuel for the brain, albeit inadequate to meet all of the brain's energy requirements — this means that in prolonged starvation there is reduction in the amount of tissue protein that needs to be catabolized for gluconeogenesis. When fasting how are metabolic fuels used? Is absorptive state the same as feasting? What is metabolic fuel for immature erythrocytes in fed state and starving state? How many calories does it take to shift your metabolism from a fasted to a fed state?